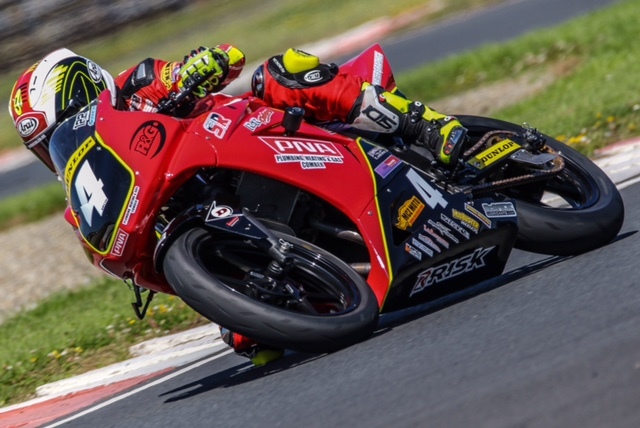 Early last month Irish and Ulster Junior Cup championship rider, Andrew Smyth packed up his Kawasaki 300 and entered the Thundersport GB round at Angelsey for the first time. 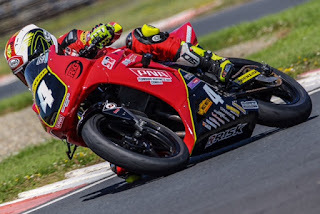 Personally mentored by Be Wiser Ducati MCE Insurance rider Glenn Irwin, Smyth was convinced he could push on for success on the Welsh Coastal circuit, a track full of elevation changes, blind entries and steeply banked curves. With qualification for the race secure towards the rear of the field, Andrew was convinced there was more speed to be extracted and so employed the services of multiple Irish Champion Ryan Farquhar for his opinion. Ryan examined the situation and soon advised of a gearing change that could improve lap times. This change dramatically improved setup and Andrew was able to cut through the racers in front to finish race 1 in 11th, 11 places ahead of his starting position. This allowed him to build momentum in race 2 where he finished in 10th. Sunday also saw more progression with another 10th place and in the final outing a personal best of 9th. Andrew completely enjoyed the Thundersport experience and the meeting was run extremely efficiently. Andrew would like to thank Ryan Farquhar for his gearing assistance and advice over the weekend.